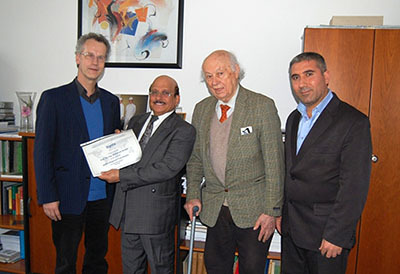 In accordance with the statutory mission and activities of ISPRS, the Society should provide funds to support scientific and other initiatives, which will further improve its international status in the field of the photogrammetry, remote sensing and spatial information sciences, and will therefore benefit all ISPRS members. After two rounds of calls for Scientific Initiatives projects for 2014 and 2015 physical years, the Council issued a new call in September 2016 for 2017 projects, with an original total budget of 40,000 Swiss Francs. By the submission deadline, twenty-two proposals were received from the five Technical Commissions. Comments were sought from the relevant Technical Commission Presidents, and a sub-committee of three Council members was convened to perform an independent review of the proposals based on their scientific merits as well as value to and promotion of ISPRS. The sub-committee then came up with a ranked list of projects; based on the ranking seven projects were recommended to the Council for approval, with a total budget of 53,400 Swiss Francs approved. Brief summaries of the accepted projects can be found at: http://www.isprs.org/documents/si/SI-2017/default.aspx. The Council looks forward to hearing of the success of the funded projects and reporting the outcomes through this and other media in due course. Project investigators are asked to consider presenting and publishing project outcomes in ISPRS events, Archives, Annals or in a suitable peer reviewed journal, as well as a summary for the ISPRS e-Bulletin. Reports on Scientific Initiative projects funded in 2014 and 2015 can be found at: http://www.isprs.org/documents/si/default.aspx. Ronald Bisio is Vice President, Geospatial at Trimble. He joined the company in 1996 and has held several marketing, sales and general management positions prior to taking over worldwide responsibility for Trimble's Surveying and Geospatial Division in 2015. He had previously held technical and marketing roles at Esri and Autodesk. He earned a master's degree in business administration from the University of Denver, a master's in regional planning from the University of Massachusetts in Amherst and an undergraduate degree in cartography from Salem State University in Salem, Mass. The Executive Committee of The ISPRS Foundation is currently seeking interested persons associated with ISPRS to join the Marketing and Promotions Committee. The role of the Committee is important in ensuring the continued financial viability of The ISPRS Foundation for fulfilling its philanthropic aims. If anyone believes they have the time, skills and commitment to work for the Marketing and Promotions Committee, please contact John Trinder with a brief description of experience and background in the marketing of organizations such as The ISPRS Foundation. On Feb. 24, 2017, Muhamad Alrajhi, Assistant Deputy Minister at the Ministry of Municipal and Rural Affairs (MOMRA) in the Kingdom of Saudi Arabia, was appointed as the new ISPRS Regional Coordinator for the Arab States following approval from the ISPRS Ordinary Members in late 2016.
attending meetings of the ISPRS Council and Advisory Board when invited to represent the views of the Arab States. Council is very pleased about this strengthening of ties between the society and the Arab world and is certain that the very good relations to the region will further improve in this way. ISPRS is very proud to report that a UK Antarctic Place-names Committee has recently named four glaciers on the Antarctic Peninsula after ISPRS pioneers of analytical and digital photogrammetric methods. 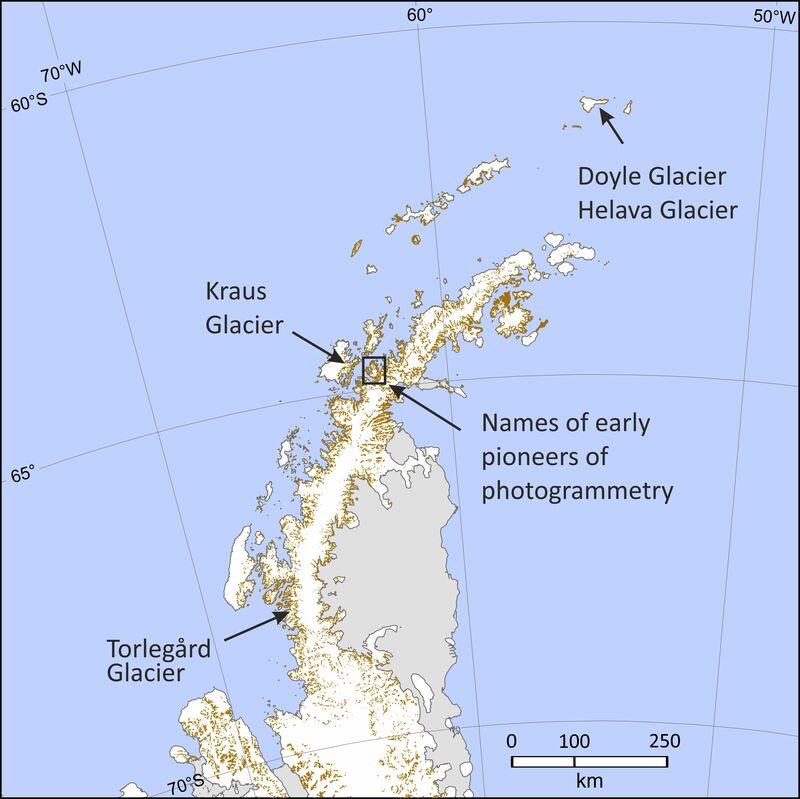 The names Doyle Glacier (Frederick J. Doyle, 1920-2013); Helava Glacier (Uuno ‘Uki’ Helava, 1923-1994); Kraus Glacier (Karl Kraus, 1939-2006) and Torlegård Glacier (Kennert Torlegård, 1937-2016) recognise the outstanding contributions these scientists made to the development of analytical and digital photogrammetric methods in recent decades, including DEM extraction using image correlation. Antarctic features only receive names where there is a need to identify them precisely for navigation, field operations or science. Here, the previously un-named glaciers were included in a joint NERC funded project between British Antarctic Survey (http://www.bas.ac.uk/) and Newcastle University (http://www.ncl.ac.uk/) to measure volume change over time for a selection of glaciers in the Antarctic Peninsula region. Modern, rigorous photogrammetric methods were applied to a previously little-exploited archive of aerial photographs dating back to the 1950s, to generate and compare surface elevation DEMs with those produced from modern day aerial and satellite imagery. The analytical and digital methods developed by the named pioneers were the key to unlocking these previously difficult to use aerial photographs and were therefore considered an apt choice for place names for the glaciers. The new place names build on an existing theme of ‘Pioneers of Photogrammetry’ on Arctowski Peninsula (64° 44′ S, 62° 27′ W) that recognise key figures in the early development of photogrammetry and include Arago Glacier, Beaupré Cove, Hugershoff Cove, Pulfrich Peak, Wild Spur, Zeiss Needle and many others. On Wednesday, March 15, at the IGTF 2017 Conference in Baltimore, ASPRS installed their new Board of Directors for the 2017-2018 year. ISPRS congratulates Rebecca Morton on her election as ASPRS President and looks forward to the continuing collaboration between the two societies under her leadership. Thanks go to Past President, Charles Toth, (ISPRS 2nd Vice President), for the cooperation during his term of office. ISPRS also congratulates Anne Hillyer, now President Elect, and Tommy Jordan who was elected Vice President. The Geospatial Industry Outlook highlights the trends and directions of the global geospatial industry along with the Countries Geospatial Readiness Index - a first ever ranking index of 50 selected countries on the basis of their geospatial readiness. Global Geospatial Industry Trends and Directions discusses the drivers of the geospatial industry such as Cloud, IoT, Robotics and Automation, Deep Learning and Artificial Intelligence, which are expanding the horizons and opportunities manifold. The report discusses how several new players are entering the geospatial industry opening new avenues for growth. It discusses how solution-centric and system integration oriented character of the industry determines successes making it imperative for businesses to explore collaborative partnerships, while maintaining unique business propositions. The Countries Geospatial Readiness Index encapsulates the geospatial infrastructure and policy framework, institutional capacity, user adoption level and the industry capacity to evaluate whether a nation is geospatial ready or not. The index, a first ever study of this type, aims to stimulate debates and discussions to identify the status of 50 countries with respect to their geospatial preparedness. The index’s purpose is to act as a benchmark to initiate the development of geospatial in the countries selected for indexing to seize new and available opportunities that can benefit society globally. The submitted application material will be evaluated by a six-member committee approved by the EuroSDR board of delegates. All material must be sent to the EuroSDR secretariat (eurosdr@kuleuven.be) to arrive no later than 1st August, 2017. The notification of the selected thesis will be sent on 20th September, 2017. The call is confined to applicants that completed their PhD study in Europe. Leica Geosystems is calling industry related professionals to submit their nominations for this year’s Carl Pulfrich Award, the prestigious industry honour that recognises advancements in the fields of photogrammetry, remote sensing and earth imaging. Dr. Carl Pulfrich launched the Photogrammetric Week in 1909 as “a vacation course in stereo-photogrammetry”. The University of Stuttgart is therefore pleased that the Carl Pulfrich Award will again be presented during the 56th Photogrammetric Week, September 11-15, 2017 in Stuttgart. Multispectral and thermal sensors were until recently too heavy and bulky for small UAV platforms, even though their potential was demonstrated almost a decade ago. Nowadays, however, lightweight multispectral and thermal sensors on small UAVs are commercially available and are used in multiple applications including precision agriculture. Multispectral and thermal sensors are mounted on drones and can be used to assess vitality of the plants, crop yield estimations and other vegetation monitoring applications. ITN-DCH Final Conference is an international event for the professionals working in the Digital Cultural Heritage domain. The aim of the conference is to bring together experts and leaders from the cultural domain and, addressing the current challenges, start a dialogue that will lay the foundation for the creation of a multidisciplinary community of practice. The Forum & Exhibition will bring together professionals and decision makers in the field of hydrometeorology/environmental monitoring and Earth Observations/Earth Remote Sensing from Russia and CIS, Europe, Middle East and Asia, as well as consumers of hydrometeorological information and Earth observations data in all of the sectors of economy and related governmental agencies of Russia and CIS: transportation, industry, agriculture, energy, construction, forestry, ecology, natural resources, emergency services, military and law enforcement, municipalities, public health, tourism, and etc. RAST2017 intends to elaborate on the benefits, accomplishments, plans and the potential of space technologies in terms of development, environment, health, education and disaster mitigation, especially for the developing World. RAST2017 has the main objective of providing a forum for the presentation and review of recent developments in space technologies especially emphasizing the space economy. It is the wish and the goal of the organizers to make RAST2017 a premier event in space technology developments especially those on the way to near future deployment. Activities in Beijing include lectures and technical visits. The lectures will be given by experts and scholars, focusing on SDI standards and policies, technical components, strategy of implementation, methods and techniques for construction and maintenance, typical applications and services, etc. Technical visits include companies with experience and products for SDI construction, maintenance, and application. The organizer of the Seminar will provide financial support to about 40 participants from Surveying and Mapping Agencies of Association of Southeast Asian Nations (ASEAN) or other developing countries. It will include the accommodations during Sept. 14-22, 2017, travel between Beijing and Wuhan, and registration fee for the ISPRS 2017 Geospatial Week, and will be arranged on a first -come-first -served basis. to improve knowledge transfer and cooperation between the industry and research/academia. The program will include several keynotes from leading, influential, recognised scientists, demos and presentations from the industry, as well as oral and poster presentations after peer review. ETH Zürich and the ICA Commission on Location Based Services are pleased to invite you to contribute to the 14th International Conference on Location Based Services. The conference will offer a common ground to colleagues from various disciplines and practice where they can meet, interact and exchange knowledge, experience, plans and ideas on how LBS can and could be improved and on how it will influence both science and society. The URSI-France 2017 Workshop, under the sponsorship of the French Academy of Sciences, was dedicated to “Radio Science for Humanity”. The workshop was held at Campus SophiaTech located in Sophia Antipolis, South of France, on February 1-3, 2017. JS'17 was co-organized by Institute Mines Telecom - Telecom ParisTech and Université Nice Sophia Antipolis. Hussein Mohammed Abdulmuttalib, on behalf of the Dubai Municipality organized GIS & Remote Sensing Annual Scientific Forum = GRASF ( http://www.grasf.ae) in Dubai, March 6-8, 2017. Organizers hosted not only the GRASF meeting, but also JURSE 2017 ( http://www.jurse2017.com), Joint Urban Remote Sensing Event within the scientific programme. The ASPRS Annual Conference Imaging & Geospatial Technology Forum, IGTF 2017 was held 12-16 March in Baltimore, Maryland, in spite of a late winter snow storm. Predictions of 0.3 m of snow did not prevent over 600 participants from gathering for quality technical sessions, exhibits, workshops and impromptu musical performances. Many thanks to ISPRS for supporting ICUG-2017 as a knowledge partner. The ISPRS affiliation has taken the conference to a greater height. We are happy to inform you that ICUG 2017 took place over a span of two days- 22nd and 23rd February 2017 at TERI University New Delhi, partnered with four national and international associations. 90 Participants from 50 institutions and 35 delegates from various Government Departments and other industries had participated in the event. Approximately 80 participants have showcased their work in ICUG-2017 at 12 different sessions. The best poster/paper award was granted to the participants in both student and non-student category. We are also glad to inform you that we have received a significant number of good research articles from prestigious institutions across the world. The response from the participants was so good, and overall the event was a grand success. We would love to continue this event in the future. Once again we sincerely thank ISPRS for the support rendered to make this event successful. We are also looking forward to your support in future as well. This theme issue covers a range of topics on point clouds generated from LiDAR and various image sources. Georeferenced point clouds collected from different platforms such as aircraft, UAV (unmanned aerial vehicles), vehicle, terrestrial scanning, hand-held devices, and backpacks of indoor and outdoor scenes, are particularly relevant to this theme issue. Point clouds generated from images such as aerial images, satellite imagery, street view panoramas, and camera phone images are also of relevance. The topics range from low-level processing to high-level understanding, including feature extraction, segmentation, recognition, and modeling. 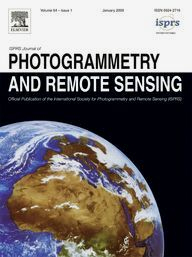 Given the above announcement, it is timely for the inclusion of a Special Issue of the ISPRS Journal covering topics on contributions of photogrammetry, remote sensing and spatial information sciences towards achieving the 17 UN Sustainable Development Goals (SDG) http://www.un.org/sustainabledevelopment/development-agenda/. A number of the SDGs can benefit from contributions from the photogrammetry, remote sensing and spatial information sciences technologies. Huang, Chih-Yuan, Liang, Steve H. L.
Leibovici, Didier G., Rosser, Julian F., Hodges, Crona, Evans, Barry, Jackson, Michael J., Higgins, Chris I.
Kuijpers, Bart, Revesz, Peter Z.